Do teachers agree with Ben Carson's push to arm them? Republican presidential candidate Ben Carson thinks we should arm teachers. Several days after the shooting at Umpqua Community College in Oregon, Carson told USA Today that if he had a kid in kindergarten, he'd feel better knowing someone at the school was armed. "If the teacher was trained in the use of that weapon and had access to it, I would be much more comfortable if they had one than if they didn't," Carson said. So, I decided to talk to the people at the heart of the issue -- the teachers. Starting with my kindergarten teacher, Mrs. Robison. My kindergarten teacher, Mrs. Robison. 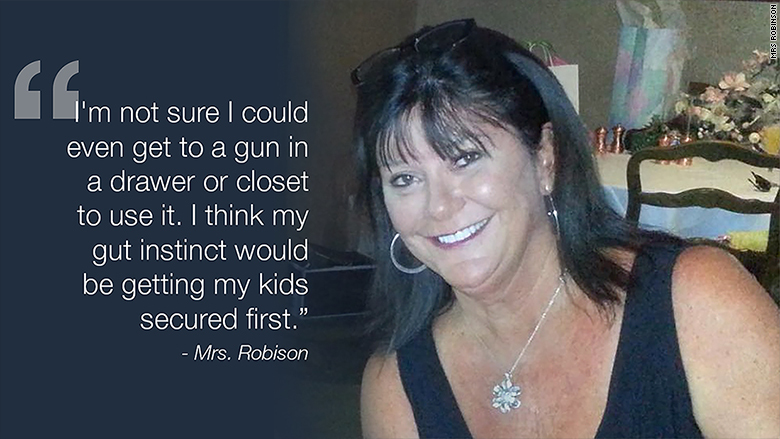 "My first thought is if I had to protect my kids from such a travesty, a gun would be welcome in that moment," Robison said. "But in reality, guns make me so nervous. I'm not sure I could really shoot someone, and under stress and being panicked I'm not sure I could even get to a gun in a drawer or closet to use it. I think my gut instinct would be getting my kids secured first." I went to school in California, and I wondered what teachers in other states would think. Michael Eisinger, a high school science teacher in upstate New York, said he didn't think arming teachers would have the "deterrent effect" people anticipated. "If a gunman is going to cause violence in a school, they are going to have the element of surprise," Eisinger said. "My guess is that they would still be able to shoot teachers, students or whoever else they wanted before some sort of coherent response materialized." Eisinger said he thought one of the keys to preventing mass shootings was a "cultural de-emphasis on firearms." Carson isn't the only candidate who thinks teachers should be packing. Donald Trump echoed Carson's belief that teachers should be armed at a campaign event in Tennessee. "Let me tell you, if you had a couple teachers with guns in that room, you would have been a hell of a lot better off," he said of the Oregon shooting. "The assumption is that some teachers are carrying, but ultimately we don't know for sure," said Ben Horsley, a spokesperson for the district. While California and New York have stricter regulations for issuing a concealed carry permit, states like Utah and Idaho are more lenient. "It's very simple," Bennett said. "Carrying a gun is a responsibility and a right." He said it's unthinkable that a teacher should be denied the right to protect themselves and their students. Bennett made news in September of last year for shooting himself in the foot. He noted that the incident was a mistake and said he'd adjusted his training as a result. "On the days I don't carry, I feel safer knowing students on campus are carrying," he said. Greg Hampikian is a biology and criminal justice professor at Idaho's Boise State University. Idaho allows concealed guns to be carried on college campuses. Hampikian is an outspoken advocate against allowing guns at schools. "When a gun is present during a conflict, each party is left guessing if the other one will shoot first. This panicked calculus -- and its often tragic consequences -- is created by the simple combination of conflict and guns," Hampikian said. "I understand the impulse to arm teachers, but the math simply does not work in favor of the students."